The Unhinged brings a very clean look up front with a smooth and punchy move. Beautiful ball! 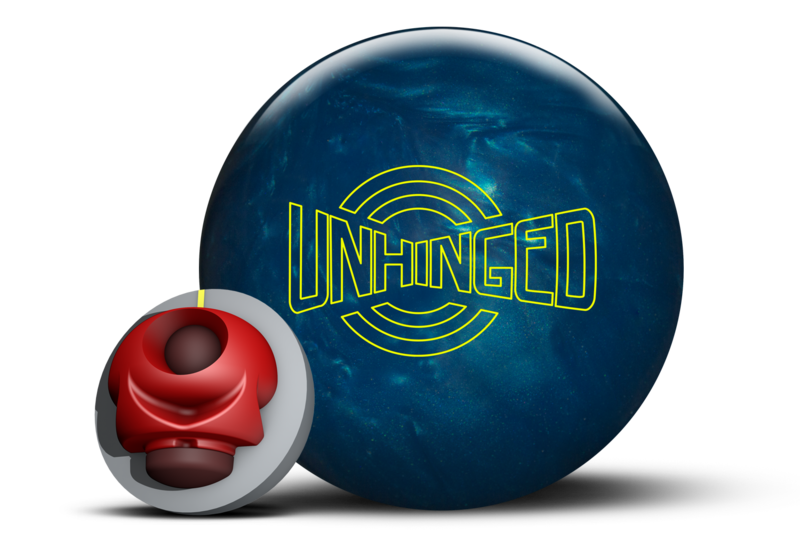 The Roto Grip Unhinged offers fair value in the midline balls. As is pretty typical, midline balls are generally pretty versatile, being usable on medium-heavy to medium-light, depending on the bowler and ball surface finish. In this case, this ball will be medium to medium-light territory. The Unhinged uses the symmetrical Late Roll 69™ weight block which has an RG of 2.58 and diff of .049 for a 15 pound ball. The cover is the 60M pearl reactive. The Roto Grip Unhinged is a nice companion to the Hysteria, as expected. The same core is utilized while a slightly weaker pearlized cover is added. It offers a very clean look up front and through the mids. A clean cover and high RG core account for this reaction. Backend reaction is smooth. This clean of a reaction can be a bit over/under if you are on fresh conditions or heavier conditions. However, once the lanes break down a bit, you will find a more predictable punchy backend motion. Shaun played various areas of the lane and you can easily see the versatility. It can be played direct but still store plenty of energy to be played from as deep as you can play. Shaun generated 6.15 degrees of entry angle on average with the Roto Grip Unhinged. He is targeting about 15 at the arrows and the ball transitions at 42 ft. This ball is very clean through the heads and transitions 1 ft after the pattern ends. It’s overall fairly smooth although the look on lane can feel “longish”. Basically, if you use it on too fresh a pattern with shine, it may give you some over/under. When it breaks down a bit, it’s a great compliment to the Hysteria by offering the same length on broken down lanes as the Hysteria offers on fresh. Overall, the Roto Grip Unhinged will likely find its way into many bags. Its price is not on the top end, it is pretty versatile, and it is an attractive ball on the shelf. For Roto Grip fans who have picked up the Hysteria, this is a no-brainer. It’s always nice to have a very clear 1-2 pair which you clearly understand how they stack up. So when the Hysteria, which is very versatile in its own right, just starts to leave flat corners, you can easily step down to the Unhinged and get the carry back.